Several years ago, actually more than 30 years ago, I went to see the movie “Flashdance.” If you haven’t seen it, it’s about a young woman who works as a welder by day and an exotic dancer by night. Her dream is to be accepted into a prestigious ballet school. As far reaching as that was, by the movie’s end she realizes her dream. A few days after I saw the movie, I was driving to work and a driver on the other side of the road swerved into my lane and nearly hit me head on. I was shaken up, but I wasn’t hit and continued on to work. It was then and there that I decided to quit my job. I knew that my life was destined for more. I walked into work and resigned. A bit rash, I know, since I didn’t have any idea what I would do next. It wasn’t the first time I had left a job without a plan and it turns out it wouldn’t be my last. I have taken many giant leaps into the abyss of the unknown, describing myself as a person who leaps first and, on the way down, begins to think of what the landing will be like. Coming to Korea knowing I would lose my job in a year and a half , based on a mandatory retirement rule, was a giant leap. I took that risk and had a ball. I was able to get another job, as an adjunct, based on my status as a wife with a spousal visa. Last semester I had a grand time teaching classes that I loved, to students who wanted to be there. I assumed that this position would last for the final 3 semesters we planned to stay until Steve would be forced to retire; an advantage of marrying someone younger than me. I returned to Korea in early September after a wonderful summer in Maine only to discover that the program I taught in is struggling to stay alive and my position was cut back to less than part-time. My first reaction was frustration that I had to, once again, figure out what to do next. Then I remembered that movie and the dreams and hopes that the young woman had. True, I’m not a young woman and, at 66, most of my career is behind me, not in front of me, but that shouldn’t stop me from having a new dream and a new direction and a new focus for the future. I’m about to jump, once again, off that precipice and I do wonder what the landing will be, but that isn’t going to stop me from jumping. It’s a choice and I plan to take that leap to find the next adventure that awaits me. I remember a friend who was dying saying to me once, “You know, I’m alive until the day I die.” We don’t know when that time will come and I know for sure that I’m not waiting around for that day. With age and experience, comes wisdom. That wisdom has taught me that every day counts and my happiness is key. There are many cute sayings about living in the moment. We hang them in our offices and in our homes and we hope to be reminded that the day we are in is all we have. I know how hard it is to live in the moment but I also know that when I focus on the day before me, it brings a smile to my face. There are so many possibilities for the future. I may not choose the perfect one, but it surely will bring me joy and that is really important. When friends ask me when I’m going to retire, I laugh to myself knowing my life has always been a balance between work and retirement, so I imagine I won’t ever stop. 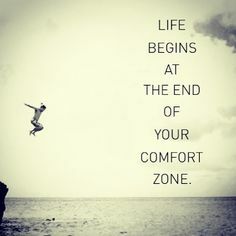 So, here’s to the next jump and knowing that life really does begin at the end of my comfort zone. The precipice awaits and I’m hoping for a smooth landing.